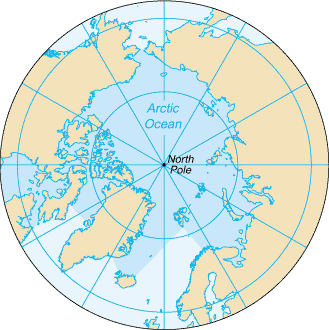 North Pole defined as the point in the northern hemisphere where the Earth’s axis of rotation meets the Earth’s surface. The north pole is often credited as having snow. But polar scientists reveal dramatic new evidence of climate change – no more ice at north pole. The North Pole ice is melting at the highest rate and as a result, there will be no ice. In other words, the pole may be completely ice-free at the surface and composed of nothing but open water by September. The disappearance of the Arctic sea ice, making it possible to reach the Pole sailing in a boat through open water, would be one of the most dramatic â€“ and worrying â€“ examples of the impact of global warming on the planet. Scientists say the ice at 90 degrees north may well have melted away by the summer.